It couldn't be more simple! I have developed the easy to use site manager which allows you to have total control of your entire website with NO PROGRAMMING EXPERIENCE. New advertisers are added & approved with simple web forms! Plus our WYSIWYG Editor allows you to do even more....add colored text, pictures, video and more with no programming knowledge whatsoever! A complete tutorial is included as well as tech support to help get you get started managing your new site. Plus, each of your advertisers get their own ACCOUNT MANAGER login, so they can update all aspects of their listing info themselves...which means you don't have to! (Above) Screen shots of the simple to use site manager. If you have ever filled out a form on the web, you can run this entire website. it easy to "Get Creative"! Edit your page content with our easy to use, Microsoft Word-like editor. Add pictures, embed videos, get creative with text and colors....you can do it all! 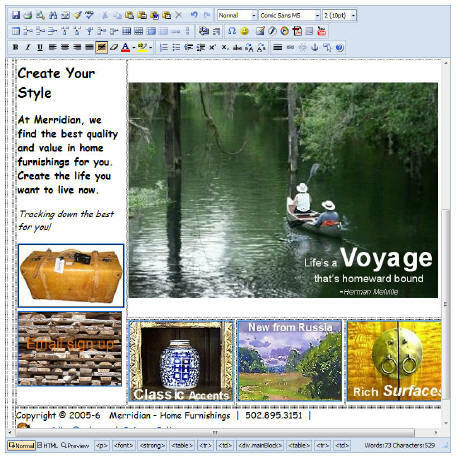 Not only can you use the editor to create great layouts, but each of your featured businesses have access to the editor as well...so they can add pictures, videos, and more to their "Business Showcase". Go ahead, give it a try and see how easy it is!